I'm sure everyone is as glad as I am that the elections are over. Between the pollsters and campaign workers, it seemed my phone rang every ten minutes...a drawback of working at home! I received only three lessons to review this week. Two were Lesson 3 so the knitters are now ready to do the Masters Program (not that they weren't ready before!). It makes me very happy when my students persevere and finish up the course. There are always fewer lessons at this time of year. So many of us are starting our holiday knitting, including me! True duplicate stitch does not work all that well with garter stitch. In the post of April 20, 2012 I discuss this and have reproduced the photo here. 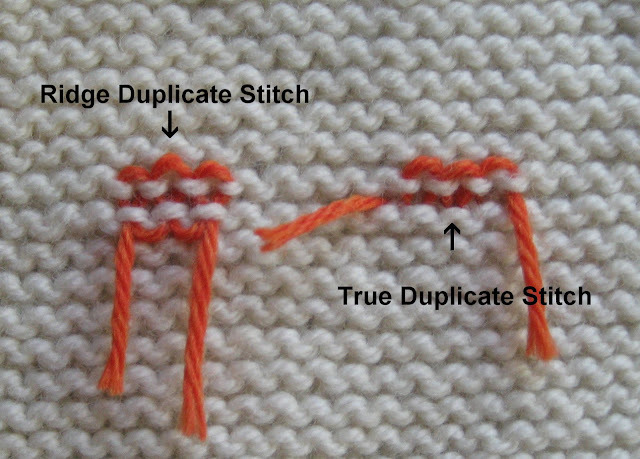 When you use true duplicate stitch (following the path of ONE row, it may show through in garter stitch. It is better to use the "smiles" and "frowns" of TWO ridges. This keeps the tail on the WS of the work. This photo shows the path of the yarn using two ridges. 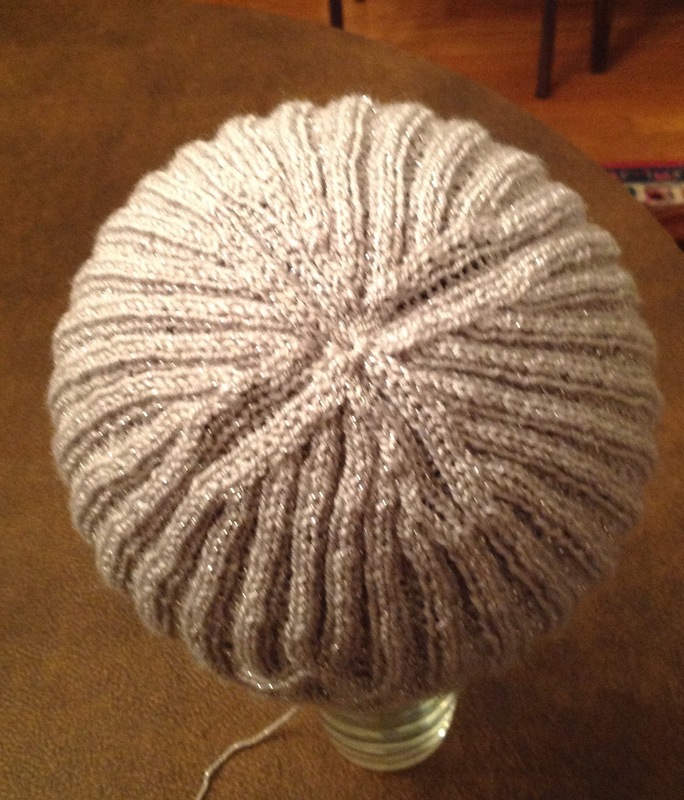 This photo shows the ridges and a numbered path of the yarn. 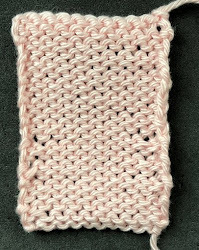 In the Basics class, there is one garter stitch swatch in Lesson 3. In Level 1 of the Masters Program there is also one garter stitch swatch. The video for this week also includes a demonstration of how to seam garter stitch. Starting in the Fall 2012, there is now a series called "Finishing with Confidence." The article for the Spring 2013 issue covers seams in reverse stockinette and in garter stitch. I decided to include this in this tip. As for weaving in tails, you need to be able to identify the "smiles" and "frowns". A properly worked seam is one where the stitch pattern continues over the seam. In garter stitch and reverse stockinette, smiles and frowns interlock to form the stitches so for the stitch pattern to continue over the seam you must also interlock smiles and frowns. When you seam garter stitch, you seam the RIDGES together, not the rows. (Remember a ridge is made up of two rows.) You seam the "smile" on one piece to the "frown" on the other. 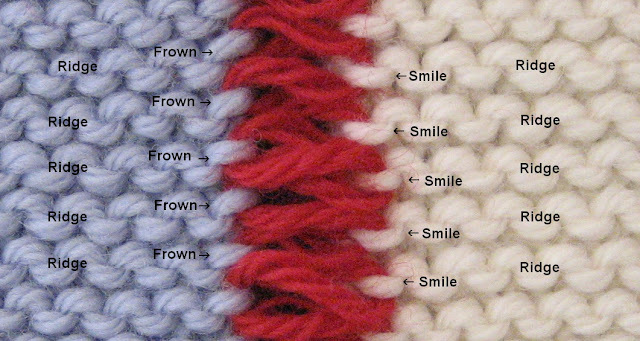 If you remember from other tips, the stitch is the frown, the smile is the space between stitches. 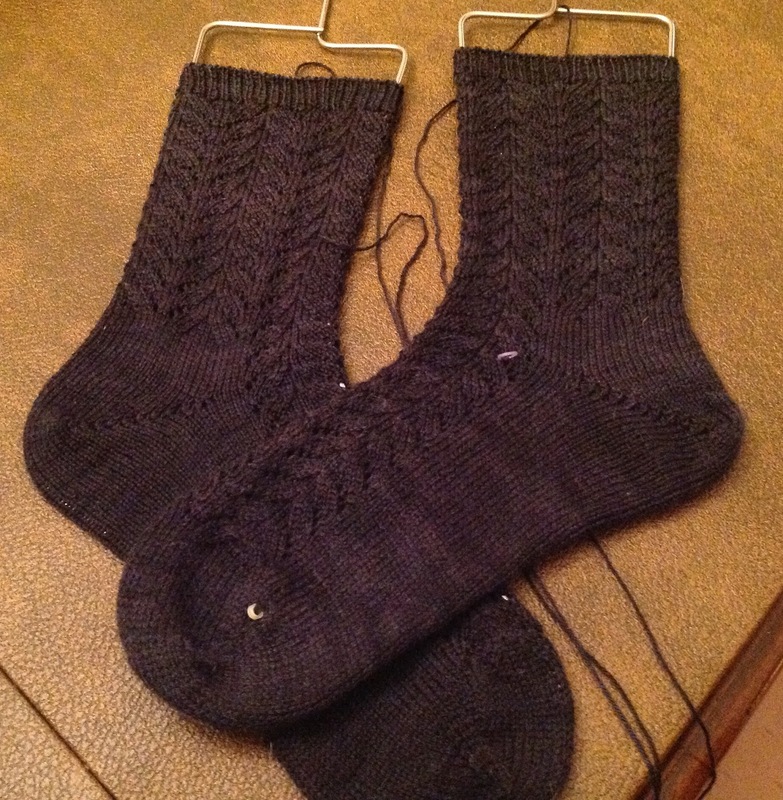 This means that on one piece you are using the frown between the selvedge stitch and the stitch next to it. On the other side, you have a choice. You can use the frown in the selvedge stitch (as in this photograph) or you can use the frown in the stitch next to the selvedge stitch. 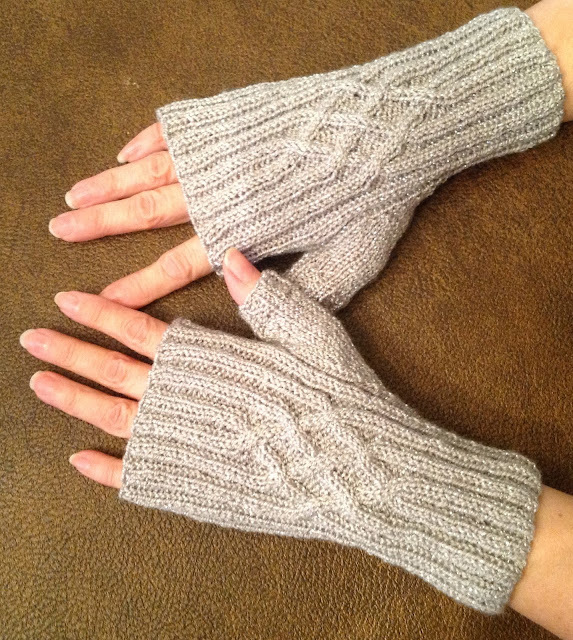 For garter stitch, I recommend using the selvedge stitch as garter stitch is bulky as it is. When the seaming thread is pulled, the stitches line up. 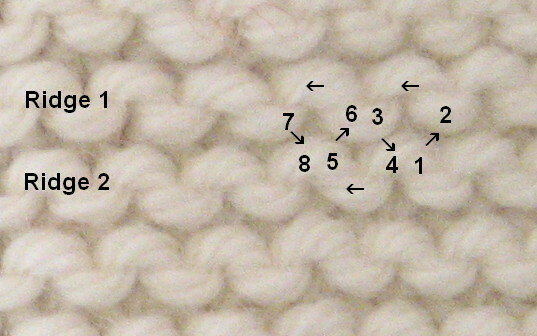 It will never be as invisible as mattress stitch in stockinette stitch. Here is the link to this week's video: Garter Stitch. Here is the link to the earlier entry: 04/20/12. By the way, I never planned to do tips on finishing but if there is interest in this, I can add that to the topics. Drop me a comment if there is something in particular you'd like to see. Salon this week will be on Sunday. The Met is doing a new production this weekend for the simulcast--The Tempest which I've not seen. I am looking forward to it. The previews were pretty spectacular. I've been trying to catch up on gifts. I did get a photograph of the Happy Sparkle Day mitts. I think I mentioned last week that the yarn was donated by Lion Brand for the goody bags at the Reno Knit and Crochet show. I very rarely work with acrylic fibers and as someone who is obsessed by tension, I found these frustrating to work on but I think they turned out OK. I am writing up the pattern for Stephanie. If anyone else who went to Reno and has the yarn would like the pattern, let me know and I'll send it off. 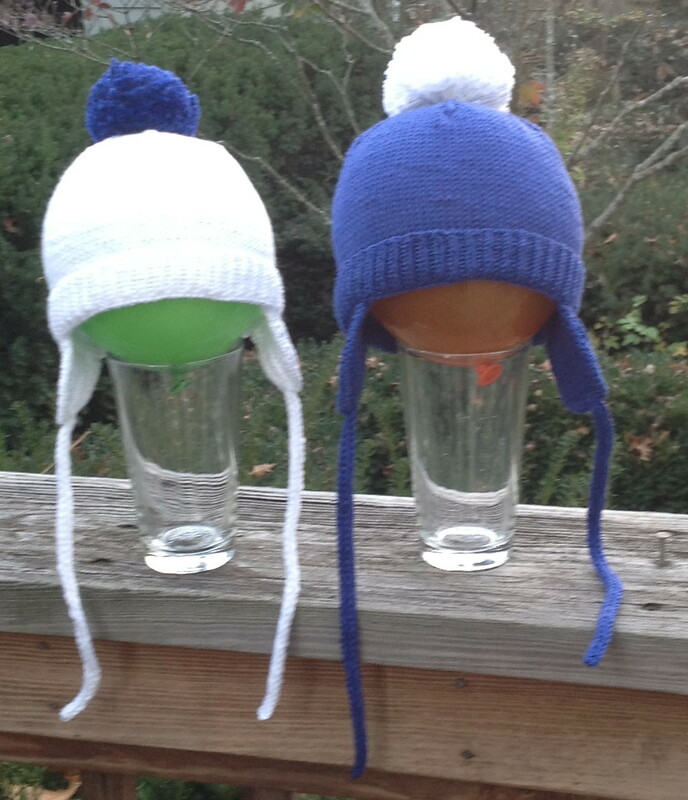 I am thinking of making some in more natural fibers for my daughters. I had enough yarn to do a matching hat. I find this photograph so funny. Normally I block my hats on balloons but there is absolutely NO POINT in blocking acrylics. This hat would look much better on an actual head. I don't think anyone has a head this round! 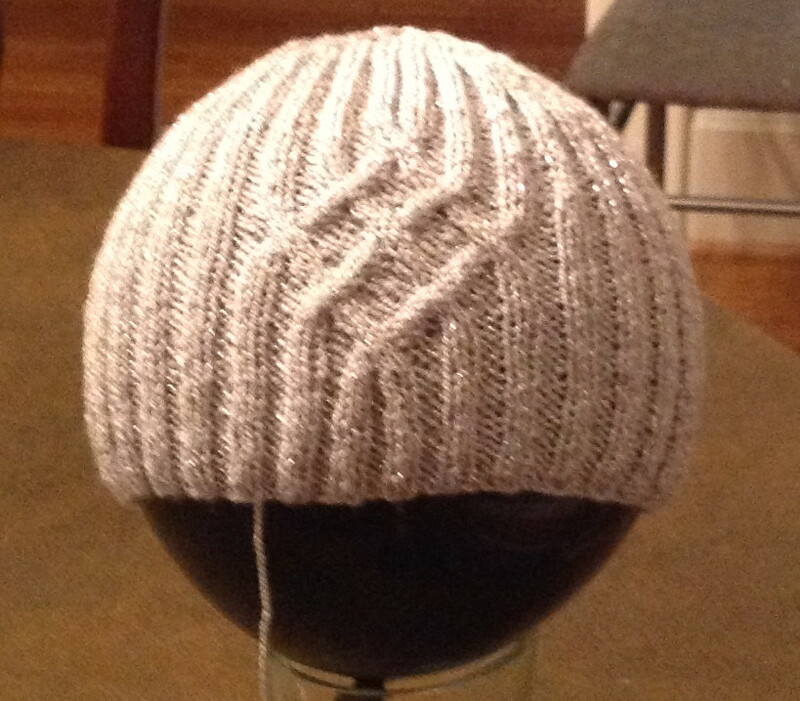 Anyone who has ever designed a hat with K2P2 ribbing knows the difficult part is shaping the crown. I have seen some very ugly hats at the crown which should only be worn by very tall people. I came up with a solution for this hat. The properties of the yarn are not ideal but this photo shows the basics construction. If I were to knit this hat again (which I think I will do) I would make it longer so the bottom could fold up. I wasn't sure I had enough yarn. As it turned out, one skein was plenty. I am writing up this pattern as well. My husband has a colleague who just adopted a baby. They are fanatical UK fans. I used the pattern for the Dread hats which are in the current issue of Cast On (just got my copy yesterday). My husband requested pom poms instead of dreads...much easier and quicker. I did one for now, one for later. The only yarn I could find in the right color of blue was Cascade Pima Cotton. I really don't like working in cotton at all. I also finished up a pair of socks for a birthday present. Don't be fooled by this photograph. The yarn is black. I used a stitch pattern from one of the Japanese stitch dictionaries. I like how they turned out.